When your fingers are freezing because your gloves are soaked, and your legs are wet because you didn’t take the time to put on your rain pants (even though you have them in your kart), and your shoes are wet because you’ve been walking up and down hills in the rain for a couple of hours, you don’t care what the hotel room costs, especially when it’s the only game in town. The desk clerk at the Hualapai Lodge in Peach Springs grudgingly admitted that she had a room for me, and I took it. But first there was the business about my “printed” AARP card vs. a “real” AARP card. I assured her the card was valid, and she could read the statement to that effect on the page I showed her. I don’t think reading was one of her strong skills, but in the end she “bent the rules” (she could “get into trouble,” she told me). Earlier that morning I was stopped by the police for the first time during my journey. 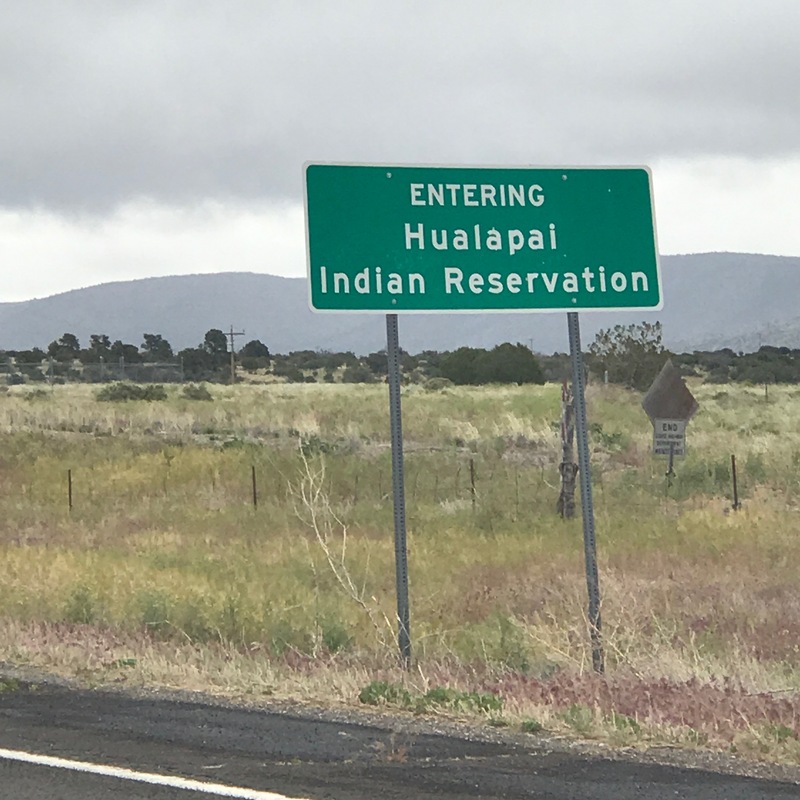 The two Hualapai Police Dept. officers were polite (as was I). They said they’d “received reports that a man pushing a stroller was walking on the wrong side of the road” (untrue) and that he was “weaving in and out of the lane” (true, but only when there was no shoulder on which to walk). One officer called in my drivers license while I chatted with the other. When the results came back (no problems, obviously), we shook hands, they smiled and wished me a safe journey, and off they drove. One of the reasons I wound up so wet was that the rain started as just a drizzle and I ignored it. I was in the middle of a long phone conversation with Sharon about a motel reservation in Seligman Thursday night and a package I needed her to ship, and didn’t pay enough attention to the increasing intensity of the rain. By the time I got my rain jacket out of the kart, it was too late to avoid getting soaked. I finally arrived at Peach Springs about 2 pm—cold, wet, and hungry, and would have paid anything for that hotel room. After I hung up all my wet stuff in the room, I made myself a tuna and cheese sandwich and called Jeannine, who’d hit a snowstorm heading into Flagstaff. She’s had a run of bad luck. And all I could think about was that I was headed to where she’s at! It was just too stressful to think about, so I went for a soak in the Jacuzzi where I met Amanda and Troy from Vail, Colorado. Two nurses in their early thirties originally from Upper Michigan, they were cycling across the country. We made a date for dinner where we continued our conversation. I heard first-hand that cycling across the US has its own stresses. We had a good time together and shared two desserts. Before dinner, I’d sorted all my clothes and re-packed my gear. At 9:30 pm I was settled in a king-sized bed thinking about the miles I’d have to walk over the next two days and the weather I’d be facing.